Autonet Insurance standardise document output from multiple back office platforms by choosing WML’s DataGateway software. Autonet Insurance, the UK’s largest independent van insurance broker has chosen WML’s DataGateway software to condition its documents produced from CDL Classic and Strata back office platforms. Get this release in PDF format. Spar and Supra supermarkets adopt PrePrint, Kyocera Prescribe document conversion software from WML. Lambrechts NV who own the Spar and Supra chain of supermarkets have chosen WML’s (William Matthew Limited) PrePrint , Kyocera Prescribe to PDF emulation software. NoMachine S. a. r. l. has promoted WML to Value Partner status for its success providing Linux terminal services and desktop virtualisation to Universities, Government organisations and large retail companies in the UK. Ageas Insurance Solutions choose WML's DataGateway software to condition documents for secure print and fulfilment outsourcing. 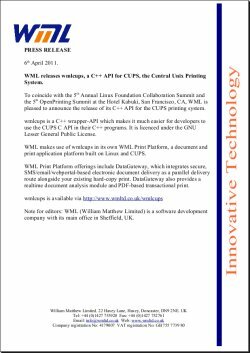 WML releases wmlcups, a C++ API for CUPS, the Central Unix Printing System.